Edge is the independent education charity dedicated to shaping the future of education in the UK. 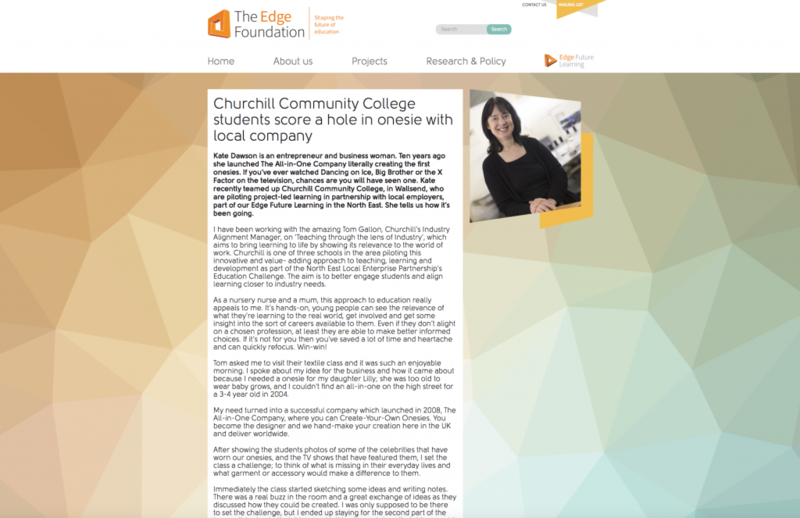 Revolutionising classrooms and education, The Edge Foundation are bringing learning to life. As a part of Edge Future Learning in the North East, Kate Dawson, Director of The All-in-One Company visited Churchill Community College, after being asked to pop into one of their Textile classes as part of their project-led learning in partnership with local employers. After a successful visit, the students were then invited to visit us here at Onesie HQ, which resulted in a lot of interest in future apprenticeships.